What are we going to do to stop this fish? In last week’s Community Development blog, which you can read here: u.osu.edu/extensioncd/2017/01/19/alien-invaders/, my colleague Tory Gabriel explained the threat of aquatic invasive species (AIS), also known as aquatic nuisance species (ANS). 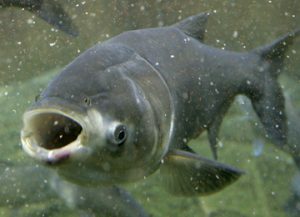 The timing of his blog worked out well for me, because in this week’s blog I am going to tell you about a study Frank Lichtkoppler and I did that was published last month in the Journal of Extension on the topic of probably the most frightening alien fish we have in the United States right now: the Asian Carp. Check out the article here: joe.org/joe/2016december/a5.php. The Asian Carp is actually four different species of fish: the black carp, grass carp, silver carp, and bighead carp. It has gained a stronghold in large portions of the Mississippi River basin in recent decades. It out-competes native fish species for habitat and food, and its population has skyrocketed as it has no local predators. It represents such an enormous threat to the fisheries of the Great Lakes that the US Army Corps of Engineers has been investigating the closure of the Chicago Area Waterway System (CAWS), the most likely route the Asian Carp could take to the Great Lakes. This system is incredibly important to shipping in the United States. Let’s say you want to ship something from Cleveland, Detroit or a similar starting point down to Memphis or New Orleans. You must leave the Great Lakes basin and enter into the Mississippi River basin to do that. And of course the same thing goes for cargo coming the other way. Before railroads, canals linking various watersheds like this played an enormous role in contributing to the national economic integration of the United States. This was key in facilitating the economic development of our then young country. Today some of the canals are partially preserved as historical attractions. But the CAWS is different. It still plays a major role in shipping as it is the only waterway linking the Great Lakes to the Mississippi River basin. Estimates of the engineering costs of closing the CAWS and re-routing storm and sanitary sewers, combined with the economic losses that will result from losing it as a transportation corridor, are in the multiple billions of dollars. So any consideration of the closure of this waterway system, which is also an important visitation attraction that I recommend you see when in Chicago, illustrates just how serious a threat the Asian Carp is. I chose the title to this current blog post partly in deference to a 2014 article from The Verge which underscores the urgency of the problem. The article is called, “America Must Kill This Fish.” I suggest that you take the time to read it here: theverge.com/2014/3/21/5533054/asian-carp-american-waterways. 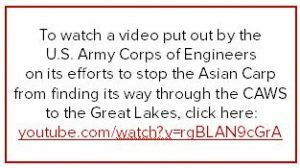 Two years before that article appeared in The Verge, back in 2012, the US Army Corps of Engineers funded a set of public opinion surveys regarding closure of the CAWS. Because of OSU Extension Sea Grant’s experience in surveying Great Lakes charter captains on a host of issues and topics, the Corps selected our organization to undertake the survey for this key stakeholder group. Charter captains have a lot at stake here because, if the Asian Carp succeeds in reaching the Great Lakes, it will do heavy damage to the fisheries there. Recreational fishermen who hire charter captains are eager to catch walleye, trout, and yellow perch, but those species will be greatly reduced or even destroyed by the presence of Asian Carp. It is not an exaggeration to say that the Asian Carp could cause the worst ecological catastrophe in the history of the Great Lakes. Our survey revealed that about 95% of charter captains favor closing the CAWS, and that the average captain is willing to pay about $95 a year to contribute to the cost of the closure. Our findings also show that charter captains who are making plans to expand their businesses are willing to pay more for closure, and the increase in willingness to pay is proportional to the magnitude of the expansions they are planning. About 17% of captains said they need more information in order to form a valid measure of their willingness to pay. And of course, the Extension Sea Grant network is currently conducting extensive outreach education to try to close this information gap. It is not clear what the future is going to be as the country faces the challenge of protecting the Great Lakes from the Asian Carp. Our study plays a modest role in assessing the environmental economic opinions of one key stakeholder group, Great Lakes charter captains. Our contributions may be in the form of leading to surveys of the broader public – including boaters, shoreline anglers and even the American population in general. This would be appropriate since, in the final analysis the Asian Carp really is a national problem and the closure of the CAWS, if it comes, will eventually rely on general taxpayer funding of some type. Another contribution we have made is to the scholarly literature on the methodology of assessing public opinion, which will potentially have implications for how researchers measure opinions on all types of environmental economic topics ranging from global climate change to recycling to preservation of endangered species. In the meantime, a number of measures have been taken to prevent the Asian Carp from crossing into the CAWS. One is an apparatus that sends a series of electrical shocks through the water as it approaches the CAWS. The level of electric shock intensifies with proximity to the waterway. For now, it seems to be effective. This brings up another point. Critics of the closure of the CAWS have been vocal in pointing out that basin separation, as attractive as it may seem to its proponents, is not a fool proof method of preventing the spread of the Asian Carp to the Great Lakes. And so the question remains: what are we going to do to stop this fish? Tom Blaine is an Associate Professor with OSU Extension, Community Development. Posted in Environmental	Tagged aquatic invasive species, aquatic nuisance species, Asian Carp, CAWS, Chicago Area Waterway System, Great Lakes	Bookmark the permalink.